Pick the right filing status before filling out your tax return. 3. What Is the Standard Deduction for Married Filing Separately? The Internal Revenue Service offers married couples options to file tax returns jointly or separately. Standard deductions are higher for joint filers, and either or both spouses can claim itemized deductions on separate returns. If one spouse can claim some larger deduction or has a significantly higher income, for instance, separate returns are a good option. The standard deduction for a single taxpayer in 2012 is $5,950, but it's double, $11,900, for a married couple filing jointly and jumps up to $13,900 if both spouses are over 65. The standard deduction for married couples who file separate returns is the same as a single filer. Each spouse also is entitled to a basic exemption of $3,800, or $7,600 if a couple files jointly, plus an exemption for each child. A couple also can itemize deductions, using a basic Form 1040 individual income tax return, if they exceed the standard deductions. These are listed on a Schedule A. These include such things as state and local income taxes, mortgage interest, real estate taxes, gifts to charity, and medical and dental expenses above 7.5 percent of the adjusted gross income (rising to 10 percent in 2013 for most taxpayers). Contributions to individual retirement accounts, for one or both spouses, also are deductible. Some spouses also can qualify for work-related or educational expenses or unreimbursed business expenses. Couples also may qualify for unreimbursed casualty or theft losses, and losses from natural disasters. Couples who opt to file separate returns also can itemize deductions, but if one spouse itemizes, the other must also instead of taking a standard individual deduction. A spouse whose medical expenses exceed 7.5 percent of income, for instance, can often claim that entire deduction when filing separately from a spouse with a much higher income. If one spouse is responsible for all or almost all of a couple's income, filing jointly and claiming either standard or itemized deductions will usually produce the lowest tax bill. 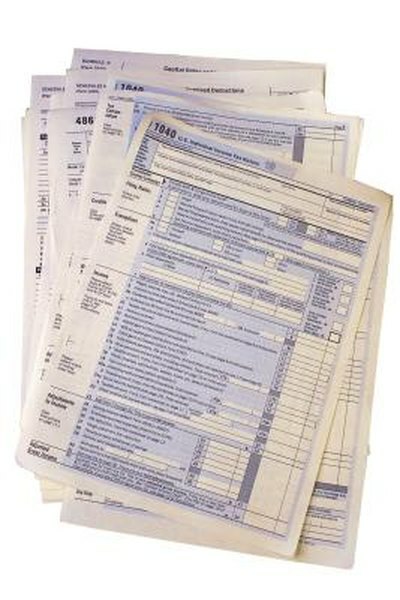 A couple filing jointly with income under $100,000 and using only standard deduction can file a Form 1040EZ, the simplest version. Those who take deductions for individual retirement account contributions or some education expenses can take standard deductions on Form 1040A. Miscellaneous itemized deductions are limited to the amount that exceeds 2 percent of your adjusted gross income. That applies to either joint income or individual, so high earners may benefit from filing separately. With separate returns a couple can split itemized deductions however it is most advantageous, and either spouse can take exemptions for children. Both spouses cannot claim the same child. Tax Policy Center: What Are Marriage Penalties and Bonuses?